The palm trees literally line the shore where the bluest of waters crash onto the green and azure coloured reef, eventually lapping at the white sand beach. This is Samoa, the sacred heart of the Pacific. Kate is on location in this tiny pacific island so find out what makes this sacred centre so special and why you should be popping it on the list for your next getaway. Fly just that little bit further than Fiji and you find the sacred centre of Samoa. It is part of the region of the Pacific known as Polynesia and holds a population of around 185,000. Her islands have narrow coastal plains with volcanic, rocky, rugged mountains in the interior. The two main islands are Upolu and Savaii and the capital, Apia, is where you will fly into the international airport. As a first time visitor to the country, I am eager to explore and experience the Samoan way. The first thing you notice about the island of Upolu is it’s drenched in rainforests. The roads are limited, just enough to get you from one side of the island to the other. However, trek beyond those roads and the rainforests reveal hidden treasures. You will find an abundance of places to explore, swim and just relax. Our first treasure was Togitogiga Waterfall, cascading into a refreshingly cool swimming hole. While it’s a popular swimming spot, there is also a recreation area ideal for games such as rugby and volleyball for those with their own equipment or a stunning place to have a picnic. Located in the village of Saleilua, it is situated few miles away from the Le Pupu Pue National Park. 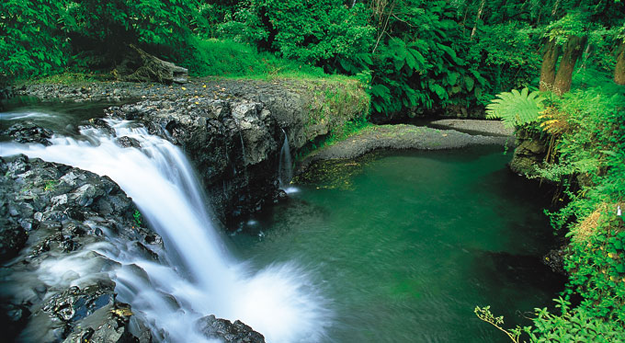 The fall is known to be used as a swimming area for the great warriors of Samoa in the past. With the promise of an even more magical place to swim, we headed off to our next hidden treasure. The pool is situated close to Lotofaga, which is a village on the south coast of Upolu island in Samoa. Affectionately named ‘The Trench’ this swimming hole is probably the most photographed in Samoa. Locally called Tosua, meaning a ‘Gigantic Swimming Hole’, it is believed that lava field blow holes made these tide pools. You need a bit of courage to get down to the water as there is a 30 meter ladder to climb down to get there. The climb is worth it though, as the view from in the water looking up at the enclosed walls of the trench is breathtaking. All refreshed, it was time to retire back to the hotel for a bit of much needed rest and recovery, as the flight into Apia arrived at the early hours of that morning. So far the island has dished up some magical delights and I cannot wait to explore further, after a good night rest.